should be matched to expected recharge rates at a site. adaptée aux valeurs attendues de la recharge sur le site. pour accroître la validité des estimations de la recharge. recarga, pero elegir las apropiadas es a menudo difícil. estudio de recarga es importante, ya que puede condicionar las escalas temporal y espacial de las estimaciones. técnicas distintas para aumentar la fiabilidad de las estimaciones de la recarga. thousands of years, depending on the particular contaminants being considered. 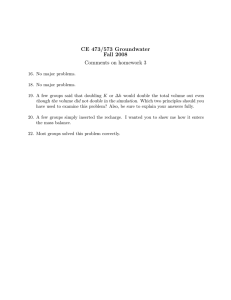 (e.g., Simmers 1988, 1997; Sharma 1989; Lerner et al. 1990; Lerner 1997; Robins 1998) and in this volume. initial estimates of recharge rates. depth (for determining unsaturated-zone thickness). 5–30 mm/year for crop/pasture rotations) (Allison et al. (US Department of Agriculture 1994). regions that may have characteristic recharge attributes. mechanisms, and spatial and temporal variability in recharge. 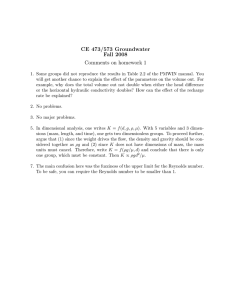 water-budget equation, this topic is described separately. reservoirs, the unsaturated zone, and the saturated zone. and therefore may be ignored. 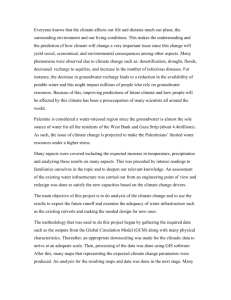 (centimeters, seconds) to global climate models (kilometers, centuries). in arid settings. 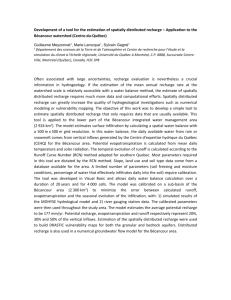 Recharge can be estimated using surfacewater data in gaining and losing surface-water bodies. channel-water budgets based on stream-gauging data. (Bouwer and Maddock 1997; Fig. 1). data and tributary flows. Gauging data in the US are generally considered to be accurate to ±5% (Rantz 1982). from a summation of shorter times. (Nathan and McMahon 1990; Arnold et al. 1995) and recession-curve displacement methods (Rorabough 1964). estimated by summation of estimates over shorter times. sodium concentrations in a two-component mixing model to determine the subsurface contribution to three alpine streams in Colorado, USA. streams in semiarid regions that are subject to erosion. types, and anticipated water fluxes beneath the stream. and matric potential simultaneously in unsaturated media. personal communication, 2001). Recharge can be estimated for time periods ranging from hours to years. years in areas of low flux. 138, and 172 mm for the three basins. Arnold et al. can be measured (~±10%) and the time scale considered. used for accurate measurements of evapotranspiration. 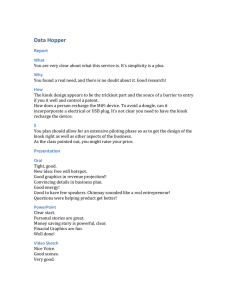 to estimate recharge because they are expensive and difficult to construct and have high maintenance requirements. They are more suitable for evaluation of evapotranspiration than recharge. vertical hydraulic gradient is zero. The ZFP separates upward (ET) from downward (drainage) water movement. point. Time scales range from event scales to years. these conditions (Hodnett and Bell 1990; Roman et al. many studies (Sammis et al. 1982; Stephens and Knowlton 1986; Healy and Mills 1991; Nimmo et al. 1994). throughout the entire year, whereas the ZFP can be applied only at certain times of the year. from excess irrigation were evaluated by Rice et al. and sampling, which is generally months to years. or atmospheric nuclear testing (3H and 36Cl) (Fig. 2). depths and locating the tracer peak may be prohibitive. at some sites have been attributed to paleoclimatic variations or to diffusion to a shallow water table (Fig. 3). es and is generally considered to be about 300 mm/year. thousands of years (Scanlon 2000). Jacobson 2000; Simmons and Meyer 2000; Flint et al. over large areas (Flint et al. 2002, this volume); however, models based on the Richards equation are often restricted to evaluating small areas (≤100 m2) or to one-dimensional flow in the shallow subsurface (≤15 m depth). 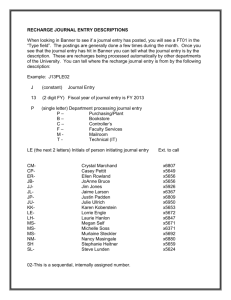 assess sensitivity of model output to various parameters. of vegetation and soil texture on recharge rates. 1959; Gerhart 1986; Hall and Risser 1993) and is described in detail by Healy and Cook (2002, this volume). (Rasmussen and Andreasen 1959). Water-level fluctuations occur in response to spatially averaged recharge. 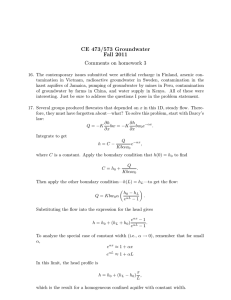 hydraulic conductivity (several orders of magnitude). ≥10,000 km2). The time periods represented by the recharge estimates range from years to hundreds of years. vertical, as in recharge areas near groundwater divides. scale; Pearson and White 1967). Horizontal flow velocities can be estimated from radioactive decay of 14C or 36Cl in a confined aquifer. the depth interval [similar to Eq. (7)]. leakage to the confined aquifer. 660 mm/year in northeastern Australia (Cook et al. wide range of recharge and hydraulic-conductivity values if the ratio between recharge and hydraulic conductivity is constant. constrain inverse modeling of recharge (Reilly et al. a unique solution requires information on one of them. from several meters squared to 1,000,000 km2 or greater. Time scales generally range from days to 100 years because of the availability of hydrologic data. rates into the various cells. the space and time scales they represent (Figs. 7 and 8). uncertainties in Cl inputs restrict the upper range of recharge rates that can be estimated with the CMB technique. settings (Scanlon et al. 1999a) in the southwestern US. useful tool to regionalize point estimates (Cook et al. divides may provide estimates of local recharge rates. are constrained by the watershed model. Nativ et al. 1995; Tyler et al. 1996; Prych 1998) and saturated zones (CFC-11, CFC-12, 3H/3He; Ekwurzel et al. 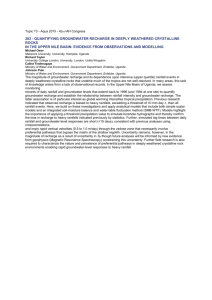 soil physics and environmental tracers (Scanlon et al. 1994; Fayer et al. 1996). preferential flow should be identified because they greatly reduce transport times through the unsaturated zone. should be based on saturated-zone data because the saturated zone generally integrates contributions from preferred pathways. fractured chalk (Nativ et al. 1995), fractured basalts, karst, and structured fine-grained sediments (Flury et al. 1988; Glass et al. 1989), air entrapment (Glass et al. 1991; Dekker and Ritsema 1994). the groundwater is more readily accommodated by preferential flow than is the transport of the bulk of the mass. perched water in unsaturated systems or in groundwater. 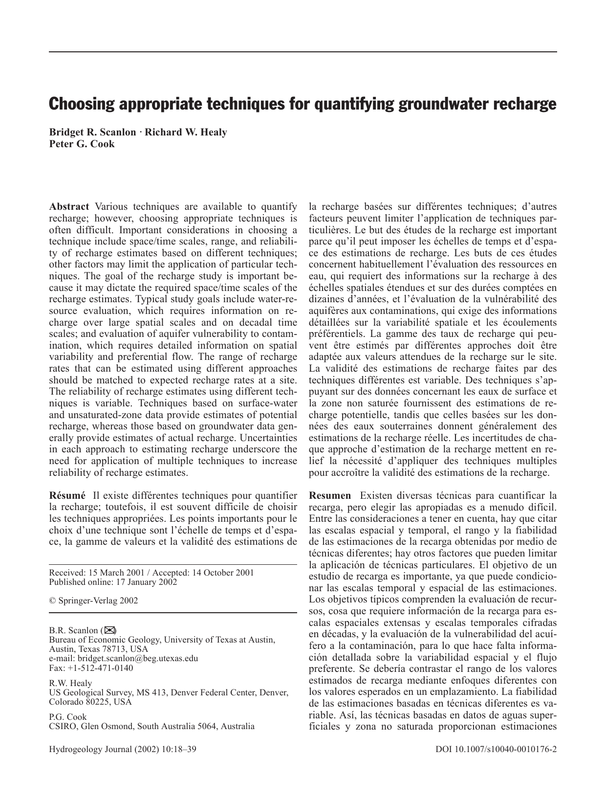 requires techniques that provide regional estimates of recharge, whereas spatial variability of recharge and preferential flow are critical to contaminant transport or determination of aquifer vulnerability to contamination. and semiarid regions where water tables are shallow. of recharge, whereas unsaturated-zone techniques generally provide estimates at points or small scales (Fig. 7). recharge estimates provided by tracers are not always advantageous, however, because they do not provide detailed information on variations in recharge over time. 3H/3He, CFCs) are used only in areas of relatively shallow (≤10 m) water tables. methods that use hydraulic-conductivity data. continual collection and analysis of data. used to estimate recharge because of uncertainties associated with each approach. determines, in part, which technique to apply. The reliability of the recharge estimates is also quite variable. Dutton, David Lerner, Robert Mace, and Marios Sophocleous. southern Australia as inferred from rainfall and wine samples. Allison GB, Hughes MW (1983) The use of natural tracers as indicators of soil-water movement in a temperate semi-arid region. 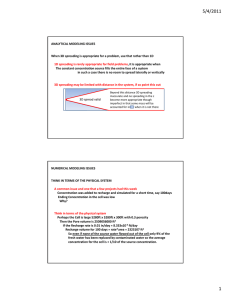 base flow separation and recession analysis techniques. Eamus D (1998) Water balance of a tropical woodland ecosystem, northern Australia: a combination of micro-meteorological, soil physical, and groundwater chemical approaches. Cook PG, Herczeg AL, McEwan KL (2001) Groundwater recharge and stream baseflow, Atherton Tablelands, Queensland. Dekker LW, Ritsema CJ (1994) How water moves in a water repellent sandy soil. 1. Potential and actual water repellency. special reference to stable isotopes and thermonuclear tritium. Egboka BCE, Cherry JA, Farvolden RN, Frind EO (1983) Migration of contaminants in groundwater at a landfill: a case study. 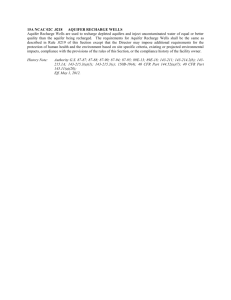 Evett SR, Warrick AW, Mathias AD (1995) Wall material and capping effects on microlysimeter temperatures and evaporation. heat flow model, theory, user manual, and examples. Rep 13249.
concentrations beneath a manured field site in Pennsylvania. for an area in the Murray Basin: its use in estimating recharge. (1987) Infiltration at Yucca Mountain, Nevada, traced by 36Cl. groundwater age and head data, Cape Cod, Massachusetts. of natural ground water recharge for the performance assessment of a low-level waste disposal facility at the Hanford site. to estimate ground-water recharge from streamflow records. to a fractured sedimentary aquifer in South Africa from a chloride mass balance and an integrated surface–subsurface model. Solomon DK, Poreda RJ, Cook PG, Hunt A (1995) Site characterization using 3H/3He ground-water ages, Cape Cod, MA. Sophocleous M (2002) Interactions between groundwater and surface water: the state of the science. Hydrogeol J (in press). simulations to hydraulic properties in an arid environment. ground-water seepage using an automatic seepage meter. different land uses: review of modeling and other approaches. Zhang L (ed) (1998) The basics of recharge and discharge.